Kahden makuuhuoneen, kahden kylpyhuoneen, Ski-In Taloyhtiöiden bussilinjan. Sijaitsee Gold Camp II monimutkainen. Kolmas kerros tuomiokirkon katto ja clerestory ikkunat. Kylpytynnyri ja sauna sijaitsee ensimmäisessä kerroksessa. Täysin varusteltu keittiö, uusi litteä sähköliesi, 3 televisiota, DVD, iPod-telakka, ja kannen näkymä Mt. Baldy. Kaasu takka. Täysi koko Etukäteispalkkio w / d.
Master Suite sisältää täyden kylpyamme ja queen bed. Toisessa makuuhuoneessa on queen bed. Ei vuodesohva. Toinen kylpyhuone on hallin toisessa makuuhuoneessa. 3 televisiota, langaton, kaasugrilli, kaasutakka. Omistaja asuu kaupungin mistään apua oleskellessaan. Täysi koko kylpyamme ja suihku sekä kylpyhuoneet. The property had all of the essential amenities for a fun and relaxing trip. The location was superb with the shuttle stop just outside and only a single stop from the lifts. Overall the unit was cozy and a good size for our group. We cooked multiple meals and enjoyed morning coffee next to the fireplace everyday. Although the property is dated everything was functioning and pricing was appropriate. We would stay here again. It was a great location in Breckenridge, very easy to get to the slopes. The owner was so helpful as well! Highly recommend this condo! Spacious, easy access to lifts/peaks and town and a great host! We loved it. 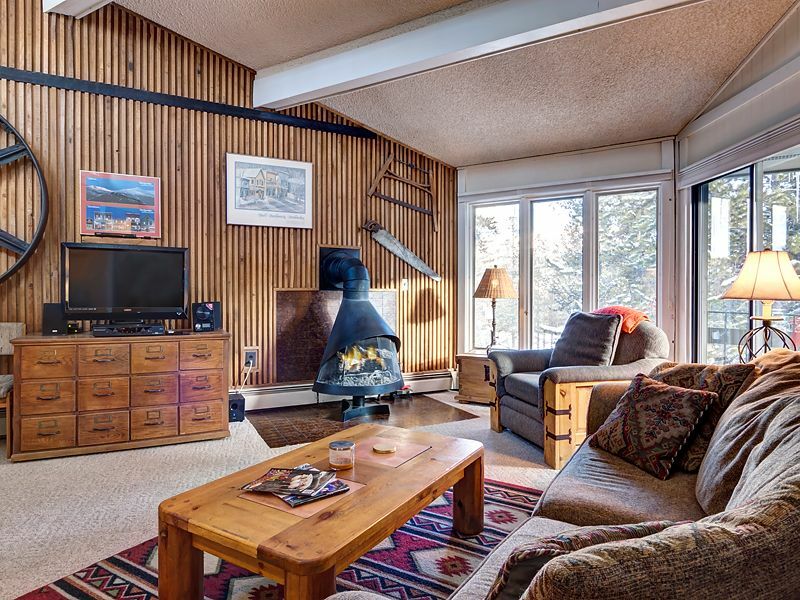 We’ve stayed in vacation rentals worldwide for decades, including many in Breck/Summit County. So many great things to say about this rental. LOCATION: You can get to peaks 7 and 8 from the bus stop right in front of the condo. At end of day, take the bus quickly back OR EVEN BETTER, ski down 4 o’clock run past the “equipment yard” to the 90 degree turn by the beautiful stone house, and slip off to the left at the opening in between the snow makers. It’s a very, very short ski or walk (depending on conditions) from there to the condo. You can also walk out to the same spot to start your day, ski down to snow flake lift and go up from there. CONDO: It’s spacious, great living/funny space. Grill on the deck. And it is soooo quiet. Loved it! Warm and inviting, we felt right at home. We cook all meals, and the kitchen was stocked with all we needed to turn out gourmet fare. HOST: In all our travels, Dave Blank is one of the most gracious, inviting hosts we’ve had the honor to know. Communicative, responsive, available, and really just an all around nice guy. He was super! We had a great week in this condo. The location is great. You are only one stop on the shuttle from the base of peak 7. The condo is also great. Plenty of space, comfortable beds, fireplace, hot tub in the building. David was great to work with and always helpful when needed. We will be back in this condo again! Great location, well stocked condo. Overall, we really enjoyed the condo. The best feature is the location. The condo itself is a little outdated, but we had everything we needed and enjoyed our stay greatly. Thanks Ryan; The location and the fact that the building only has 6 condos compared to other Gold Camp II buildings with 14 units is a nice quiet feature along with spacious feeling provided by the cathedral ceiling. The floor plan is also larger by 100 square feet to other Gold Camp II condos. The design motif has a mining accent to compliment the Breckenridge history of the gold and silver mining days. New w/d and rustic bedroom furniture, gas fireplace, and mining relics add to the ambiance. My main issue was with the unit owner’s booking practices. I visited Breckenridge with an old college friend who happens to be black. Less than one week before the owner accepted my reservation request on VRBO he denied my friends identical request claiming the dates had become unavailable. My friend is a business owner and has rented properties in Breck frequently prior to this episode. Having said that, his race would have been easily ascertained by the unit owner with a quick Facebook search. We can’t imagine any other reason why his reservation request would have been denied. Mark; First of all I do not have a Facebook account and have never logged onto Facebook . Second of all your claim is ludicrous. I do not discriminate in any way, shape, or form. My renter arriving February 8 from Australia, a repeat customer not reserved through Home Away, changed her reservation due to travel plans by one night between you and your traveling companion's requests for accommodations which made your requested time available. If you are going to charge discrimination you should at least check the facts before doing so. I can provide you with 30 years of rental history that debunks our insinuation. Happy you enjoyed your stay.
. Cancellations Policy: Full refund for cancellation one month in advance of arrival. 1/2 refund 2 weeks in advance of arrival. Full refund at anytime before arrival if condo is re rented. Owner will work with renter to find acceptable resolution with liberal refund policy.